Abstract. Four prostaglandin E2 receptor subtypes designated EP1, EP2, EP3, and EP4 have been shown to mediate a variety of effects of prostaglandin E2 (PGE2) on glomerular hemodynamics, tubular salt and water reabsorption, and on blood vessels in the human kidney. Despite the important role of renal PGE2, the localization of PGE2 receptor proteins in the human kidney is unknown. The present study used antipeptide antibodies to the EP1 to EP4 receptor proteins for immunolocalization in human kidney tissue. Immunoblot studies using these antibodies demonstrated distinct bands in membrane fraction from human kidney. 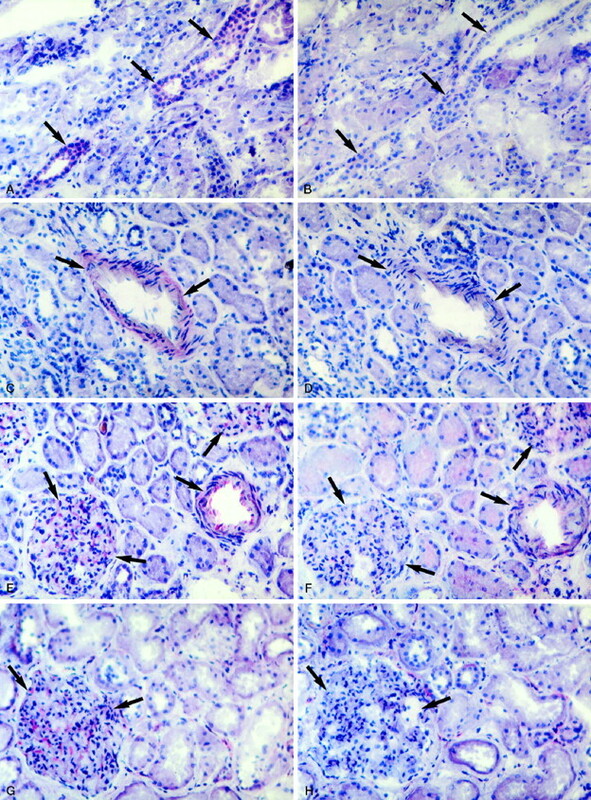 By means of immunohistochemistry, expression of the human EP1 receptor subtype protein in renal tissue was detected mainly in connecting segments, cortical and medullary collecting ducts, and in the media of arteries and afferent and efferent arterioles. The human EP2 receptor subtype protein was detectable only in the media of arteries and arterioles. The human EP3 receptor subtype protein was strongly expressed in glomeruli, Tamm-Horsfall negative late distal convoluted tubules, connecting segments, cortical and medullary collecting ducts, as well as in the media and the endothelial cells of arteries and arterioles. Staining of the human EP4 receptor subtype protein was observed in glomeruli and in the media of arteries. However, no signal of either receptor subtype was detected in the thick ascending limb, the macula densa, or in adjacent juxtaglomerular cells. These results support the concept that PGE2 modulates specific functions in different anatomical structures of the human kidney. The kidney is a major site of arachidonic acid release and its subsequent enzymatic conversion to multiple bioactive prostanoids via the cyclooxygenase metabolic pathway. Prostaglandin E2 (PGE2) is a member of this substance group that plays an important role in renal physiology. Multiple effects of PGE2 on vascular smooth muscle tonus, glomerular cell function, renin release, and renal salt and water transport have been described (1). However, experimental evidence obtained in a number of studies was generated in animal models. The role of PGE2 in the human kidney is therefore poorly defined. It has been appreciated that the different actions of PGE2 are mediated via specific G protein-coupled cell surface receptors (2,3). On the basis of pharmacologic investigations and as suggested by recent molecular studies, E-prostanoid (EP) receptors can be subdivided into at least four types: EP1 through EP4. Stimulation of the EP1 receptor results in activation of phosphatidylinositol (PI) hydrolysis and in elevation of intracellular Ca2+ concentration (4). EP2 and EP4 receptors increase intracellular cAMP concentration through activation of adenylate cyclase (5,6). The EP3 receptor inhibits adenylate cyclase leading to a decrease of cAMP concentration (7). Furthermore, for the EP3 receptor the existence of different spliced isoforms coupling to different signaling systems is discussed (7,8,9). In general, the presence of different PGE2 receptors offers a potential explanation for the multiple effects of PGE2. In view of the specific signal transduction by the EP receptors, knowledge of the specific EP receptor distribution is required to facilitate interpretation of the action of substances influencing renal PGE2 levels. Consequently, several studies have focused on the identification of renal EP receptor expression and distribution. 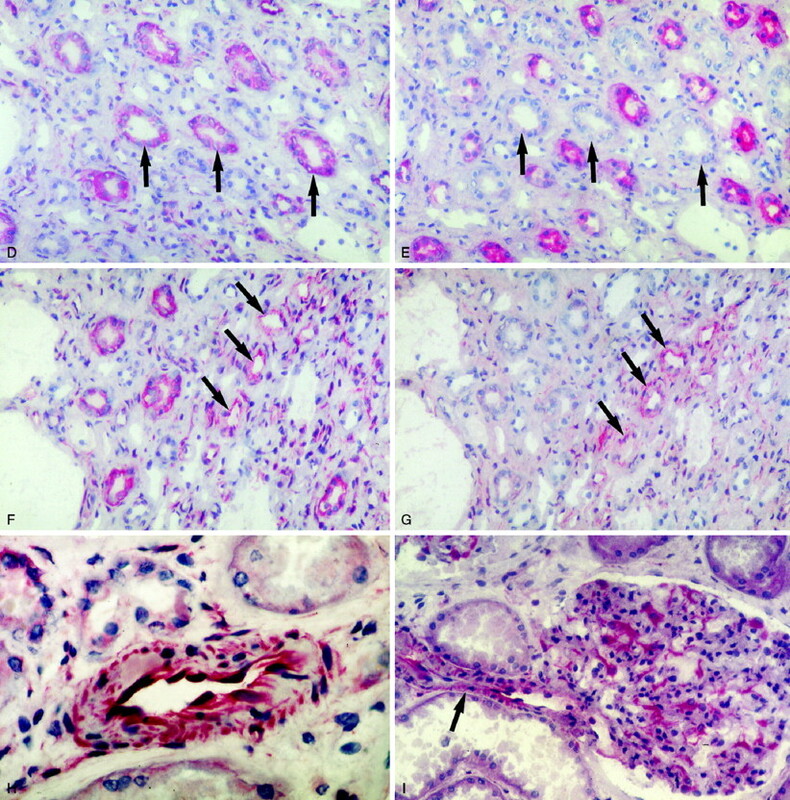 Using techniques such as reverse transcription-PCR and in situ hybridization, intrarenal expression of EP receptor mRNA in different species including humans was investigated (10,11,12,13,14). These studies demonstrated distinct cellular localization of the four PGE2 receptor mRNA in the kidney. However, it was also implicated that the distribution of the human EP3 receptor subtype mRNA, in particular, may differ from other species (11,12,13,14). In addition, the presence of mRNA does not necessarily indicate the presence of the corresponding protein, and documentation of the EP receptor protein distribution in the human kidney has not yet been demonstrated. For these reasons, we investigated the expression of the four known EP receptors in human kidney by means of immunohistochemistry with specific antibodies directed against synthetic peptides. All chemicals were of highest grade and purchased from Fluka (Deisenhofen, Germany), Merck (Darmstadt, Germany), Roth (Karlsruhe, Germany), and Sigma (Deisenhofen, Germany). Cell culture products were received from PAA (Cölbe, Germany). Monoclonal anti-Tamm-Horsfall antibody was obtained from Cedar Lane (Ontario, Canada), and monoclonal anti-smooth muscle cell actin antibody was from Sigma (Deisenhofen, Germany). All other antibodies and sera were purchased from Dako (Copehagen, Denmark). Antibodies directed against peptides of the four subtypes of PGE2 receptor were prepared as described below. Based on hydrophilicity of the human EP receptor proteins, two to three peptides for each receptor subtype were synthesized using the multiple antigen peptide (MAP) system according to Tam (15) to form macromolecules applicable for direct immunization. Rabbit polyclonal antibodies against the following peptides were used in this study: NH2-318ALAVGGWSSTSLQRPL-333COOH for EP1 receptor, NH2-3NASNDSQSEDCETRQW-18COOH for EP2 receptor, NH2-306IFNQTSVEMCK-THTEK-321COOH for EP3 receptor, and NH2-79TYMKGQWPGGQPLCEY-94COOH for EP4 receptor. The peptide for EP3 receptor is present in all splicing variants of EP3 receptor protein. The sequences are taken from sequence data bank and have the accession nos. L22647, U19487, X83857, and L28175, respectively. Immunization of rabbits was performed by Eurogentec (Seraing, Belgium). According to their standard protocol, two animals for each antigen were immunized by subcutaneous injection with 20 to 100 μg of the different peptides three times every 4 wk. The reactivity of the polyclonal antibodies was assessed by enzyme-linked immunosorbent assay as described (16). Only antibodies of highest titer against their specific peptides were used for further characterization. Furthermore, reactivity to the other receptor peptides was evaluated but no cross-reactivity was observed. After bleeding, a protein G column (Pharmacia Biotech) was used to separate IgG from rabbit sera. This Ig fraction was concentrated and used for immunoblotting and immunohistochemistry. The antibodies against the EP2 and EP3 receptor were further purified by affinity chromatography. Briefly, 1 to 10 mg of the synthetic peptides was immobilized to a N-hydroxy-succinimide-activated HiTrap affinity column (Pharmacia Biotech) according to the instructions of the supplier. The immunoglobulins were subjected to affinity chromatography, and specifically bound antibodies were eluted with 0.1 M glycin, pH 2.7, and immediately neutralized. Efficiency of purification was controlled by enzyme-linked immunosorbent assay. Human renal tissue was obtained from tumor nephrectomy specimens, cut in small pieces, and kept in ice-cold 5 mM Tris-HCl, pH 7.4, containing 5 mM phenylmethylsulfonyl fluoride. After disruption of the tissue using a Polytron homogenizer (Kinematica, Lucerne, Switzerland) followed by 10 strokes in a Potter-Elvehjem homogenizer (Kobe, Marburg, Germany), the homogenate was centrifuged at 1000 × g for 30 min to separate undisrupted tissue and at 10,000 × g for 30 min to separate the membrane fraction. The resulting pellet was resuspended in ice-cold 20 mM Tris-HCl, pH 7.4, containing 10 mM 3-[(3-cholamidopropyl)dimethylamino]-1-propanesulfonate and 20% glycerol for solubilization and centrifuged at 150,000 × g for 60 min. The supernatant containing membrane proteins was stored at -80°C until use. Protein concentration was determined with bicinchoninic acid according to the protocol of the supplier (Pierce, oud-Beijiland, The Netherlands) with bovine serum albumin as protein standard. Sodium dodecyl sulfate-polyacrylamide gel electrophoresis was conducted under denaturing, reducing conditions using 7.5% polyacrylamide slab gels (17). Proteins (80 μg/lane) were transferred onto nitrocellulose paper by electroblotting (18) using a discontinuous buffer system (19) followed by cutting of the membrane in 2-cm strips. The nitrocellulose strips were blocked with 5% nonfat dry milk in Tris-buffered saline (TBS: 25 mM Tris, pH 7.5, 150 mM NaCl) at 4°C overnight, followed by an incubation in 5% normal goat serum for 30 min. After washing with 0.1% Tween 20/TBS (TTBS), primary polyclonal antibodies (1:40 to 1:300 in 5% goat serum/TTBS) were applied for 4 h at room temperature. For detection of bound antibodies, a goat anti-rabbit IgG peroxidase conjugate (1:7500 in 5% goat serum/TTBS) was added to the membranes and incubated at room temperature for 45 min. After four wash cycles of 10 min with TTBS, visualization was achieved by enhanced chemiluminescence technique (Amersham, Buckinghamshire, United Kingdom) with exposure times of 5 s to 2 min to autoradiographic film. In a control experiment, the primary antibody was omitted. In this experiment, no protein bands were visible after the staining procedure. Human renal tissue was obtained from tumor nephrectomy specimens. Only the normal surrounding renal tissue was examined. Tissues were immediately pasted with tissue adhesive on a piece of cardboard, snap-frozen at -100°C in isopentane, and stored at -80°C until cryostat sectioning. Sections of nominal 5-μm thickness were cut and thaw-mounted onto poly-L-lysine-coated slides. After air drying, slides were kept at -80°C until use. All handling and use of human tissue was approved by the ethics committee of the Philipps University of Marburg. Slides were incubated at room temperature for 20 min, incubated in acetone for 10 min at 4°C, and air-dried at room temperature. The slides were incubated for 45 min at 37°C with a polyclonal antibody diluted in phosphate-buffered saline (PBS) containing 10% unspecific goat serum. After three washes with PBS, the slides were incubated for 30 min at 37°C with a monoclonal mouse anti-rabbit antibody (1:70). After three additional washes with PBS, slides were incubated with a polyclonal rabbit anti-mouse antibody (1:70) for 30 min at 37°C, and after three more washes were incubated for 30 min at 37°C with an APAAP (alkaline phosphatase anti-alkaline phosphatase) complex (1:70). After further PBS washes, the color reaction was performed by the addition of substrate solution according to the protocol of the supplier (Dako). This reaction was stopped by washing, and the slides were counterstained with Mayer's hemalum solution for 1 min and finally mounted in mowiol. For competition immunohistochemistry, the EP receptor antibodies were preincubated with or without the peptides (500 μg/ml) against which they were generated for 2 h at room temperature. Thereafter, the antibody-peptide mixture was applied on serial kidney sections and immunohistochemical staining was performed as described above. Some sections were stained in the presence of an unrelated peptide (NH2-NPNFILSQVNQTDDTKM-COOH, a peptide of human ROMK1 potassium channel protein); however, this incubation has had no effect on the antibody staining (data not shown). Tamm-Horsfall represents an antigen of the medullary and cortical thick ascending limb and the early distal convoluted tubule (20). The Tamm-Horsfall positive region of the nephron was localized by staining with anti-Tamm-Horsfall antibody. Vasa recta were identified by staining with anti-smooth muscle actin antibody. The other parts of the nephron (blood vessels, proximal tubules, connecting segments, and collecting ducts) were identified by their morphologic appearance. All sections were cross-examined by a nephropathologist. The specificity of the different polyclonal antibodies was assessed in four ways. First, only sera with highest titers against their specific peptide and no cross-reactivity toward the other peptides were used. Second, antibodies directed against different peptides of the same receptor protein and excluded from further use owing to their low titers or high background exhibited similar signal distribution (data not shown). Third, Western blot analysis was performed to identify immunoreactive proteins. For this purpose human kidney tissue was used. As shown in Figure 1, distinct proteins of different apparent molecular masses were identified by the various anti-EP receptor antibodies. We observed a protein band of approximately 64 kD by staining with anti-EP1 receptor antibody and a 68-kD protein identified by anti-EP2 receptor antibody. A single band of approximately 62 kD could be observed using anti-EP3 receptor antibody. The anti-EP4 receptor antibody identified a major protein band of 47 kD and a minor protein band of 78 kD. Fourth, the specificity of the labeling obtained in kidney sections was controlled by preabsorption of the purified anti-EP receptor antibodies before immunohistochemistry with an excess of EP peptide against which the antibodies were raised. The labeling was specific as it could be blocked by preincubation of the antibodies with the synthetic peptide (Figure 2, A through H). Coincubation with an unrelated peptide has had no effect on labeling (data not shown). Western blot analysis of prostaglandin E2 (PGE2) receptor subtype proteins in human kidney tissue after membrane protein (80 μg/lane) separation by 7.5% sodium dodecyl sulfate-polyacrylamide gel electrophoresis and transfer onto nitrocellulose membrane. For each antibody, distinct protein bands were detected in human kidney tissue. The positions of molecular weight markers are indicated. The apparent mobilities of the receptor proteins were 64 kD for EP1, 68 kD for EP2, 62 kD for EP3, and 78 kD and 47 kD for EP4 protein, respectively. Competition immunohistochemistry using an excess amount of peptide coincubated with the relevant antibody before its application on serial kidney sections. Panels A, C, E, and G demonstrate staining with the antibodies against EP1, EP2, EP3, and EP4 peptide without peptide coincubation and Panels B, D, F, and H with peptide coincubation. Cortical sections of human kidney tissue are shown, and a clear suppression of the staining (specific signals and their suppressions are marked by arrows) is observed after preincubation with the peptide. Renal EP1 Receptor. The antibody to human EP1 receptor distinctly labeled connecting segments and cortical collecting ducts as well as inner and outer medullary collecting ducts in human kidney (Figure 3, A through C). Furthermore, a pronounced labeling of the media of arteries, vasa recta, and peritubular capillaries was observed (Figure 3, B through D). From outer medullary vasa recta to inner medullary vasa recta, a decrease of the signal intensity was noted (data not shown). In addition, antigenicity toward this anti-EP1 receptor antibody was exhibited by cells that represent cells of the vas afferens and vas efferens (Figure 3E). Furthermore, a weak intraglomerular staining was observed. No reactivity of the antibody was found in proximal tubules, thin limbs, and thick ascending limbs of Henle's loop and distal convoluted tubules. Localization of EP1 receptor subtype immunoreactive protein in adult human kidney sections. (A) In renal cortex, expression of EP1 receptor protein is prominent in a connecting segment (small arrow) and cortical collecting duct (large arrow). No staining is seen in proximal tubules. (B) In renal inner medulla, staining of EP1 receptor protein is observed in inner medullary collecting ducts and in peritubular capillaries (arrows). (C) In renal outer medulla, EP1 receptor protein is found in outer medullary collecting ducts and in vasa recta (arrow). Cells of Henle's loop are negative. (D) EP1 receptor immunoreactivity is found in smooth muscle cells of a renal artery. (E) Presence of EP1 receptor protein in smooth muscle cells of an afferent arteriole (large arrow) and efferent arteriole (small arrow). No positivity is visible in glomerular cells, in proximal tubules, or in distal tubules. Magnification: ×200 in A, B, D and E; ×400 in C.
Renal EP2 Receptor. 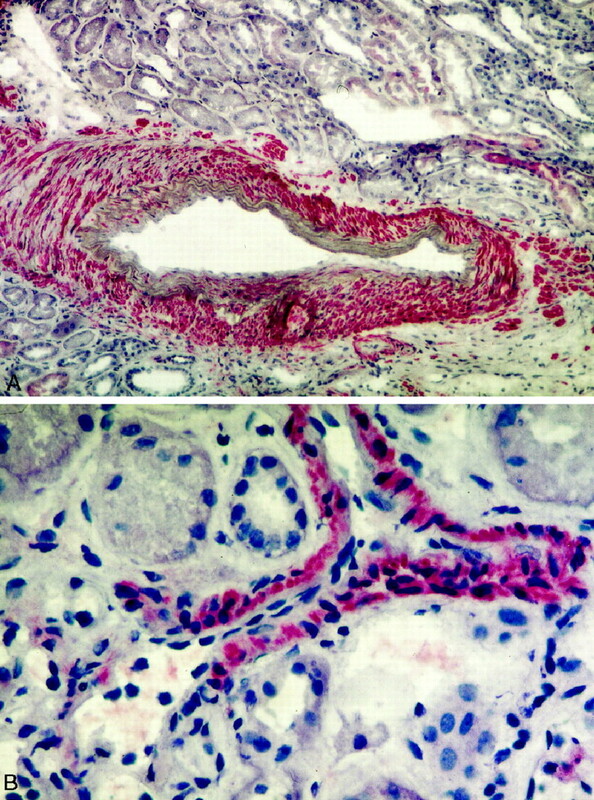 Prominent staining of EP2 receptor was only present in the media of arteries and of glomerular arterioles (Figure 4, A and B). A subset of both cortical and medullary interstitial cells showed moderate immunoreactivity. No expression of EP2 receptor protein was noted in other structures of human renal cortex or medulla. Localization of EP2 receptor subtype immunoreactive protein in adult human kidney. (A) Expression of EP2 receptor protein is found in smooth muscle cells of a renal artery. No staining is detectable in proximal tubules, distal tubules, or collecting ducts. (B) Labeling of EP2 receptor protein is shown in smooth muscle cells of an afferent arteriole. Proximal and distal tubules are not stained. Magnification: ×100 in A; ×400 in B.
Renal EP3 Receptor. The antibody directed against EP3 receptor exhibited a specific signal in late distal convoluted tubules, connecting segments, and in cortical and medullary collecting ducts (Figure 5, A through C,Figure 5D). Localization of EP3 receptor antibody with respect to antibody specific for Tamm-Horsfall protein in serial kidney sections showed that EP3 receptor immunoreactivity is localized to the Tamm-Horsfall negative region of the distal tubules (Figure 5, A through D,Figure 5D). Moreover, neither proximal tubules nor thin limbs of Henle's loop were stained. The media and the endothelium of arteries, vasa recta, and peritubular capillaries were also intensively stained Figure 5, F and H). For identification of vasa recta, a serial section was stained by anti-smooth muscle actin antibody (Figure 5G). From outer medullary vasa recta to inner medullary vasa recta, a decrease of the signal intensity was apparent. The juxtaglomerular afferent arteriole was strongly recognized in addition to cells within the glomerulus (Figure 5I). Localization of EP3 receptor subtype immunoreactive protein in adult human kidney sections. (A) In renal cortex, expression of EP3 receptor protein is visible in a cortical collecting tubule. (B) Presence of EP3 receptor protein in a connecting segment (small arrow) and a cortical collecting tubule (large arrow). No specific staining is visible in proximal tubules. (C) In renal cortex, EP3 receptor protein is found in a Tamm-Horsfall negative late distal convoluted tubule (large arrows). Tamm-Horsfall positive tubules were identified by specific anti-Tamm-Horsfall antibody (data not shown). No positivity is visible in another distal tubule (small arrow) or proximal tubules. Localization of EP3 receptor subtype immunoreactive protein in adult human kidney sections. (D) Expression of EP3 receptor protein is present in medullary collecting tubules (some are marked by arrows, compare with serial section in Panel E). No staining was found in thin limbs of Henle's loop or in Tamm-Horsfall positive thick ascending limbs. (E) Labeling of Tamm-Horsfall glycoprotein in medullary thick ascending limbs. The EP3 positive tubules corresponding to Panel D are indicated by arrows. (F) EP3 receptor protein is visible in outer medullary smooth muscle actin positive vasa recta (marked by arrows, compare with serial section in Panel G) and medullary collecting ducts. Peritubular capillaries and some interstitial cells exhibit antigenicity. No staining is found in cells of the thin limb of Henle's loop or thick ascending limbs. (G) Labeling of smooth muscle actin (arrows) in outer medullary vasa recta. (H) In renal cortex, expression of EP3 receptor protein is found in the endothelium and the media of a renal artery. On the left, the stained part of a collecting duct is visible. No positivity is present in proximal tubules. (I) Presence of EP3 receptor protein in the endothelium and smooth muscle cells of an afferent arteriole (arrows) and glomerular cells. No expression is seen in proximal tubules. Magnification: ×400 in A through C; ×200 in D through G and I; and ×500 in H.
Renal EP4 Receptors. The strongest expression of the protein for the human EP4 receptor subtype was observed in media of arteries as well as in vasa recta (Figure 6, A and B). Again, signal intensities of the labeled cells were highest in the outer medullary vasa recta and decreased toward the inner medullary vasa recta. Microscopic examination of the cortex revealed an intense staining within the glomeruli (Figure 6C). No significant staining was observed in the other parts of the kidney, especially in proximal tubules, thin limbs and thick ascending limbs of Henle's loop, distal convoluted tubules, or collecting ducts. Localization of EP4 receptor subtype immunoreactive protein in adult human kidney section. 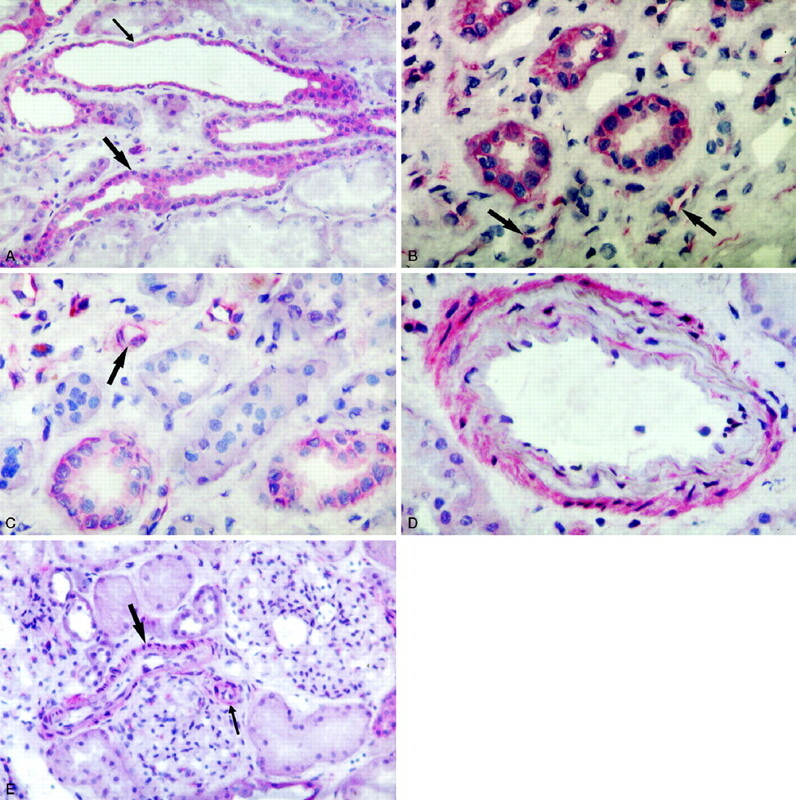 (A) Positive staining of EP4 receptor protein is visible in the media of a renal artery. No positivity is present in proximal tubules. (B) In renal outer medulla, labeling of EP4 receptor protein is observed in vasa recta. (C) Expression of EP4 receptor protein is prominent in glomerular cells. Magnification: ×200 in A through C.
In membrane fraction of human kidney, the four EP receptor antibodies detected distinct protein bands. However, the apparent mobilities were different from the theoretical molecular masses: for EP1 64 kD instead of 41.8 kD (4), for EP2 68 kD instead of 39.4 kD (5), and for EP4 47 kD and 78 kD instead of the predicted 53 kD (6). The 47-kD protein may be a degradation product, although we have used proteinase inhibitors in the preparation buffers. For the EP3 receptor, at least nine cDNA variants were genetically identified that may be encoding eight distinct protein isoforms with molecular weights ranging from 40.5 to 47.3 (21). However, in human kidney only a single protein isoform with the apparent mass of 62 kD appeared to be expressed. The difference between the predicted molecular mass and the apparent mass may be due to posttranslational modification of the receptor protein such as glycosylation and/or phosphorylation. Moreover, membrane proteins are known to sometimes show anomalous migration behavior in sodium dodecyl sulfate-polyacrylamide gel electrophoresis (22). Renal Blood Vessels. The distribution of EP subtype receptor in the vascular bed has found minor attention in recent studies focused on EP receptor mRNA distribution (11,12,13,14). Mainly based on animal experiments, PGE2 is shown to be a potent vasodilator in renal interlobular arteries and afferent arterioles (23), whereas no effects on efferent arterioles have been described. This observation would suggest the presence of EP2 or EP4 receptors, as these receptors are coupled to the increase in intracellular cAMP and thereby promote vasodilation. However, we observed the expression of EP1, EP2, EP3, and EP4 receptors in smooth muscle cells of the vascular bed. This points to a more complex control of the vessel tone. The presence of EP1 and EP3 receptor may be indicative of the ability of PGE2 to antagonize vasodilation. This is supported by earlier studies demonstrating that PGE2 also induces vaso-constriction in the rat kidney (24). The future use of EP subtype-selective antagonists may help to clarify this question. A different expression of EP receptors was observed for the postglomerular vascular bed, the vasa recta. It is assumed that the vasa recta may be a target for regulation of the regional distribution of medullary blood flow (25). The renal medulla is capable of producing a large quantity of prostaglandins, and different studies suggest that prostaglandins of I- and E-type modulate medullary blood flow in kidney (25,26,27), e.g., by counteracting angiotensin II or endothelin-induced vasoconstriction. Because of this, prostaglandins play an important role in protecting the renal medulla against ischemic damage. Our study suggests that PGE2 acts via EP1, EP3, and EP4 receptor subtypes in vasa recta. It is noteworthy that in human kidney, both cyclooxygenase isoforms, COX-1 and COX-2, were localized in vasa recta (28). However, it is unknown whether these enzymes are differentially involved in the synthesis of PGE2 for stimulation of the EP1, EP3, or EP4 receptor in cells of vasa recta. Glomerulus. Glomerular prostaglandins are thought to affect GFR (29) and renin release (30). PGE2 has been shown to elevate cAMP in isolated rat glomeruli and cultured glomerular cells (31) and to increase GFR by mesangial relaxation (32). Our observation of EP4 receptor expression in glomerular cells is in accordance with this assumption. This is supported in a study by Breyer et al. (14) demonstrating the expression of EP4 receptor mRNA in glomerular cells. The involvement of observed EP3 receptor expression for glomerular control awaits further clarification. Interestingly, no specific labeling with any of the anti-EP receptor antibodies could be localized to juxtaglomerular cells. Various studies report the modulation of renin release by PGE2. Addressing this aspect, a direct and indirect action of PGE2 on renin-producing cells was suggested (30). Concerning our observed EP3 receptor expression in endothelial cells of the afferent arterioles, it appears plausible that PGE2 might act in these cells as a cofactor for other stimuli to induce renin release in juxtaglomerular cells. Distal Tubule. The distal tubule represents an important location for electrolyte reabsorption controlled by PGE2. In our study, we observed the expression of the EP3 receptor type in this segment of the nephron. However, an uneven distribution along the distal tubule was observed. The thick ascending limb of Henle's loop and the early distal convoluted tubule (20), defined by the presence of Tamm-Horsfall protein, was negative for EP3 receptor protein expression. 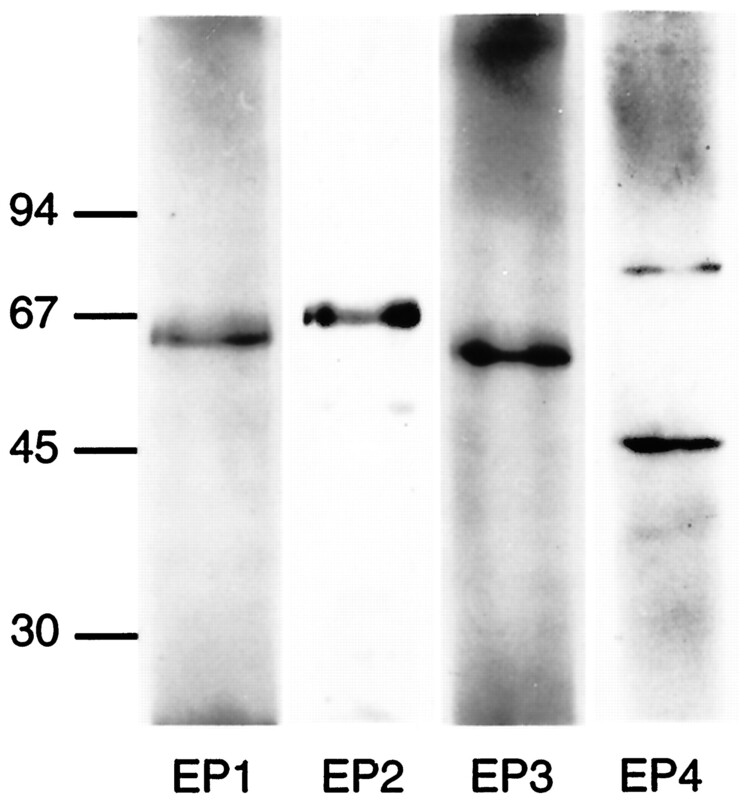 The Tamm-Horsfall negative part exhibited strong staining with anti-EP3 receptor antibody. In agreement with our findings, a study using in situ hybridization also failed to localize the EP3 receptor mRNA in the Tamm-Horsfall positive region of cortical distal tubule (14). However, in that study EP3 receptor mRNA was found to be expressed in thick ascending limb of renal outer medulla. It is noteworthy that most physiologic data on PGE2 action such as inhibition of NaCl absorption (33) or the inhibition of the Na-K-2Cl cotransporter (34) have been collected through animal studies. Because significant differences in the hormonal regulation of nephron function must be presumed to exist between species, this may account for the discrepancy between EP3 receptor expression in humans and the physiologic animal studies. Other explanations may be an indirect influence of PGE2 on cells of the Tamm-Horsfall positive thick ascending limb, the expression of the EP receptor below our limit of detection, or the presence of an up to now unknown EP receptor subtype in this part of the nephron. Collecting Tubule. In the collecting ducts, PGE2 is thought to influence the electrolyte and water balance (3). Different signaling mechanisms are involved in orchestrating these renal mechanisms. In rabbit cortical collecting ducts, PGE2 is shown to inhibit Na+ reabsoption (35). An increase of intracellular Ca2+ and activation of protein kinase C is suggested to play an important role in this natriuretic effect of PGE2 (36). Our observation of EP1 receptor expression in the collecting duct system supports this suggestion, because the EP1 receptor type is coupled to the PI response and Ca2+ increase. The classic effect of PGE2 is the inhibition of AVP-stimulated osmotic water flow in collecting ducts. An increase of intracellular Ca2+, activation of protein kinase C (37), and also the inhibition of intracellular cAMP generation are suggested to mediate this effect of PGE2 (38). In accordance, we were able to demonstrate the presence of EP3 receptor protein, known to blunt intracellular cAMP generation by coupling to an inhibitory G protein (7). Hence, sulprostone, which is an agonist for EP1 and EP3 receptor, mimics these effects of PGE2 in the rabbit (39). Moreover, at least in rabbit, PGE2 itself increases basal water permeability in cortical collecting ducts (40). However, sulprostone had been shown to have no effect on direct basal water permeability, implicating the presence of a cAMP rising receptor of type EP2 or EP4 (39). However, neither our immunohistochemical study nor an in situ hybridization study (14) could demonstrate the presence of the EP2 or the EP4 receptor proteins or mRNA in the collecting duct system. Evidence also exists for actions of prostaglandins on outer and inner medullary collecting ducts. Some studies have shown that PGE2 inhibits net HCO3- absorption in the rabbit outer medullary collecting ducts (41) and that inhibition of cyclooxygenase produces anti-natriuresis and increases accumulation of Na+ in the renal papillae (42). In isolated rabbit inner medullary collecting duct cells, an inhibition of Na-K-ATPase by PGE2 could be demonstrated (43). According to our immunohistochemical study, EP1 and EP3 receptor proteins are present in the inner and outer medullary collecting ducts and could therefore be candidates as target for PGE2. This is supported by studies demonstrating expression of EP1 and EP3 mRNA (10,12,13) in this part of the collecting tubule system in mouse and rat. It remains to be established whether these PGE2 effects can be blocked by EP1 or EP3 receptor-selective antagonists. In summary, all four known EP receptor subtypes are expressed in human kidney, and we present for the first time evidence for a distinct cellular localization of their proteins. Most of the various observed effects of PGE2 in controlling functions of the human kidney can be explained by the distribution of these four receptor proteins. Our findings on PGE2 receptor localization could prove to be an important tool for the potential use of EP subtype-specific agonists or antagonists in human renal disorders. On the basis of our study, the mechanism used by PGE2 to influence renin release, the multiple possibilities of PGE2 to act on renal vascular tonus, and the mechanisms underlying the effects of PGE2 on cells of the medullary thick ascending limb and on the basal water permeability in the cortical collecting ducts warrant further investigation. This work was supported by a grant from the Deutsche Forschungs-gemeinschaft (Nu 73/5-2). We thank H.-J. Gröne and M. Kömhoff for cross-examination of the kidney sections and for helpful discussions, and A. and C. Strassburg for proofreading the manuscript. The skillful technical assistance of Kirsten Kuhn is acknowledged. Is There a Role for PGE2 in Urinary Concentration? Localization and steroid regulation of prostaglandin E2 receptor protein expression in ovine cervix. Prostaglandin EP receptors: Targets for treatment and prevention of colorectal cancer?